Salubrious View Too is the perfect vacation home for gatherings of friends and families - for those who want to wind down and enjoy our renowned Sunset Beach. We are situated on Madd Inlet, on the west end of the Island, where the beach is wide and perfect for bike riding. 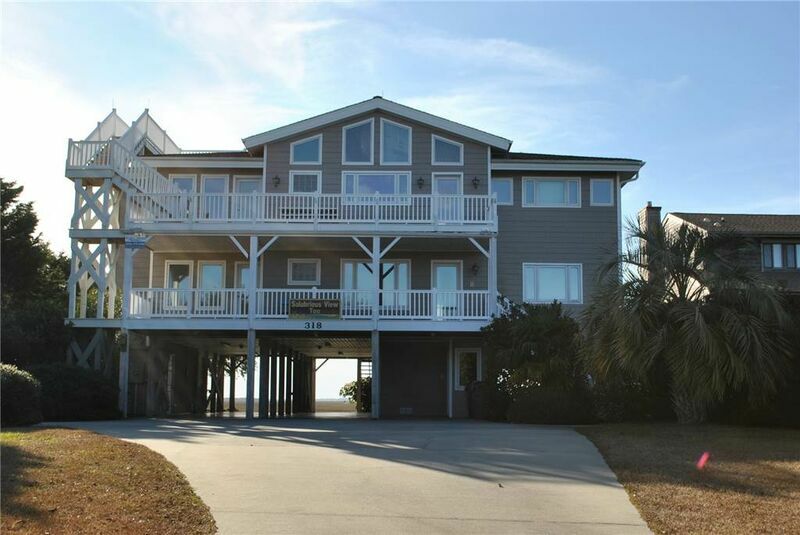 The homes's many decks overlook tidal creeks and marshes, the ocean, undeveloped Bird Island Ia NC Bird Habitat), the Intracoastal Waterway, and breathtaking sunsets. This 4300 sq. Ft. Home features a cozy great room with fireplace, a dining area for 10-12, and a fully equipped kitchen with separate dining island on the uppermost, third level. Master king bedroom with Jacuzzi tub/dual shower, and handicap-accessible queen bedroom are on upper level, as well as guest half bath. A screen porch overlooks the ocean. An elevator (500 lb capacity) services all levels. The second level has a large "rec room" with sink/refrigerator/TV/DVD/pingpong/game table. Four bedrooms on this level include: 1 King and queen share a bath, the "kid's room", 1 queen/bunk (ie sleeps 4) adjoin large bath.The "library" with Queen bed has close proximity to half bath. (Total 6 BR- 4 king, 2 queen, 1 bunk; 4 full baths, 2 half baths; sleeps 14) Other amenities include: Wireless access, outdoor gas grill, access tidal dock, bikes, kayaks, canoes, paddleboard. This is a non smoking and no pet home. ELEVATOR IS NOT AVAILABLE FOR GUESTS AT THIS TIME.. IT CAN BE USED FOR LUGGAGE AND GROCERIES ONLY. We have stayed at sunset beach for several years at different houses. This house was by far the best! Very spacious and well stocked. We have never stayed on this part of the island before and we fell in love with canoeing in the marsh - including grandma and grandpa! If we can coordinate schedules, we will definitely be back!